No, what the Federal Reserve fears most is a problem of its own creation: the consequences of its bloated balance sheet. Many Americans know by now that the Fed's easy money policies have included not just near-zero interest rates, but several programs of bond-buying known as "quantitative easing," or QE. Since the start of the 2007-2008 financial crisis, the Federal Reserve has sunk $3.1 trillion into QE, which has bloated the liabilities on the central bank's balance sheet to approximately $4.3 trillion. 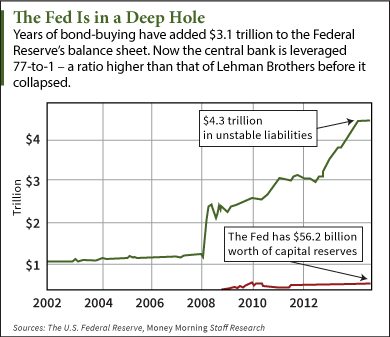 Meanwhile, the Fed's capital reserves – the assets on the balance sheet – amount to a mere $56.2 billion. That means the Federal Reserve, the biggest bank in the world, is leveraged 77-to-1; its liabilities are 77 times its assets. Just for some perspective, that's more than double the leverage that Lehman Brothers had just before it failed. And the problem could be much worse than it appears. You see, the Federal Reserve reports the bonds that it holds at face value, not what their actual market value is – what a buyer would be willing to pay, known as "mark to market." So it's possible that the value of the Fed's vast bond holdings have already slipped below the value of its assets, which technically would mean the central bank is insolvent. That's not hard to imagine, as much of the assets purchased in the QE programs were "toxic," particularly the mortgage-backed securities that triggered the financial crisis.